Every once in a while, I come across a well-written and interesting book where, at the end, I walk away feeling tremendously...ticked off. I can't give an accurate rating based on the happy face system. Thus, this book gets "no rating" status. Riley, at seventeen, is a demon trapper apprentice who dreams of being a Master demon trapper just like her father. As an apprentice, she rarely gets to spend time with her father because he is forced to work long hours trapping demons in order to pay her mother's medical bills and keep food on the table. The ever predictable demons begin to do strange things and the security measures in place for demon trapper safety is starting to fall apart. In the midst of tragedy, Riley searches for answers to the mystifying events occurring around her. 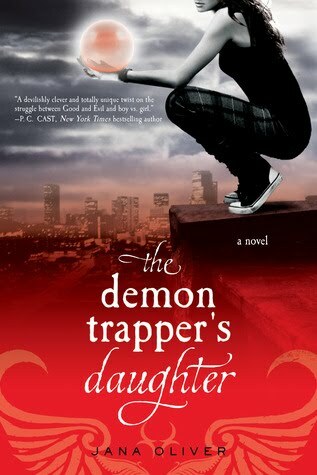 I was captivated by Riley and The Demon Trappers from the very beginning and settled in for a fun adventurous read. The setting feels more dystopian and we enter a world where evil might have finally eclipsed good. I enjoyed the characters and found them to be well-developed. I see the potential for a love triangle between Riley, Beck, and Simon but we just settle for hints rather than a full blown romance. In this book Simon is the love interest but I'm probably team Beck. He seems like a better fit I enjoyed the world created by Ms. Oliver and despite a few inconsistencies, I thought it was developed quite well. There were a couple of times where the dialogue between some of the more obnoxious characters made me cringe and uncomfortable but it didn't happen often and it was very much in character. The action kept me sitting on the edge of my seat and I didn't want to put this book down. To be clear, I definitely recommend this book to those who like YA books full of adventure, supernatural creatures, and a hint of romance. How I felt at the end of the book did no justice to the quality of the novel. My biggest PERSONAL problem with this book is that nothing good happened at all. Perhaps it will happen in future books but NOTHING good happened. I just didn't get the point. Imagine The Hunger Games trilogy... Now imagine that everyone who died throughout the trilogy, died in the very first book. Just think about it. Just think about all those people especially the most controversial (I'm trying not to include spoilers). Uhhh... I just walked away feeling so discouraged and with no feelings of hope. Possibly this is my fault. I didn't expect this book to be so dark. I expected conflict and fights and all that good stuff. But I didn't expect this. Maybe it was the cover or maybe I'm just naive but I was truly taken off guard.